Jewish Home minister meets Bedouin students, inaugurates new Bedouin high school. 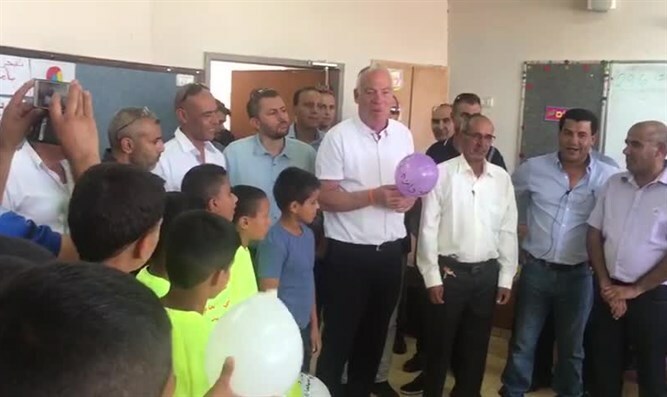 Agriculture Minister Uri Ariel (Jewish Home) on Tuesday visited Bedouin schools in Israel's south, in honor of the new school year. In addition to his position as Agriculture Minister, Ariel is the minister in charge of developing Bedouin communities in the Negev. During his visit, Ariel met with first graders and high school students. Ariel inaugurated the new Bedouin "Ort Abu Talul" high school southeast of Be'er Sheva, on Highway 25. The new school has sixteen classrooms, an elementary school, four preschool classrooms, and a daycare. A sports stadium will soon be completed. Ariel also visited the Alsnabl elementary school in Umm Batin, northeast of Be'er Sheva. In the coming months, an additional elementary school will open, with six out of a planned 18 classrooms. He also met with Settlement Authority for the Bedouin in the Negev Director Yair Maayan, and the principals of both schools. Speaking to the students, Ariel said, "I came to wish you well, and to wish you a good and blessed year. May there be peace." In 2013, a proposal was made to build 5 new Jewish towns between Be'er Sheva and Dimona, along Highway 25. In 2015, the Israeli government approved the plan. However, the plan never moved forward because Bedouin living illegally in the area protested the move. Instead, Interior Minister Aryeh Deri transferred 14,000 dunams (3459.5 acres) from the Bnei Shimon Regional Council to the Bedouin city of Rahat, in order to aid the legal settlement of the Abu Quaidar tribe. Last month, Deri forced Dimona Mayor Benny Biton to agree to gift 101.5 acres (411 dunams) of the city's land to the neighboring illegal Bedouin enclave of Qasr al-Sir.